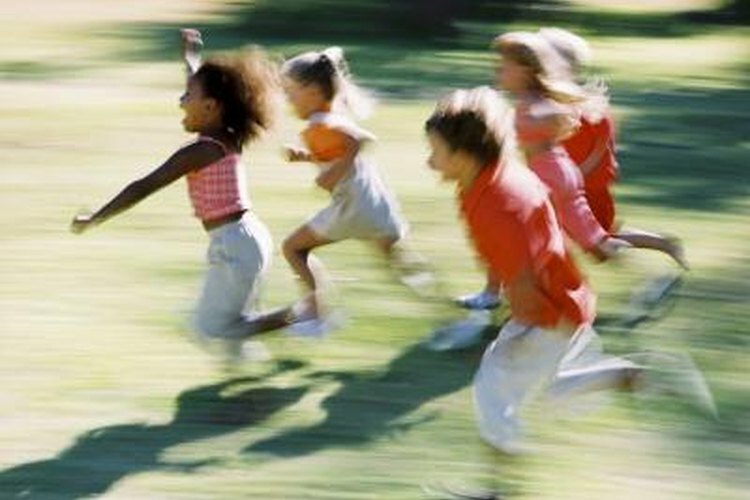 A group of kids running on the lawn. A traditional sport popular in India, kho kho is comparable to a team version of the game of tag. Two teams take turns being the chasers and defenders and the team that’s able to tag their opponents out faster is the winner. Kho kho requires running, squatting and diving, as well as communication between teammates, so it helps develop stamina and agility and also promotes teamwork. In kho kho, two teams of 12 players each compete against each other. The teams take turns being the chasing and defending teams and the goal of the game is for your team to tag all the players on the opposing team in the shortest time. The game is played on a rectangular field traditionally sized at 27 meters by 15 meters (about 90 by 50 feet) with two wooden poles positioned at the center point of each end line. If you don't have access to an official kho kho court, you can make your own by using poles or sticks that come to shoulder height and chalk or cones to mark out the perimeter of the field. A kho kho match consists of two innings, with each inning containing turns of chasing and running for seven minutes each for both teams. A five minute rest period is provided in between innings and two minutes of rest in between half innings, when the teams alternate between chasing and defense. Eight of the 12 chasing team members kneel in a row down the middle of the court, length-wise, alternating in which direction they face. A ninth player on the chasing team, which is referred as the chaser, stands beside one of the wooden poles that are positioned on opposite sides of the field. The chaser is the player who will pursue and attempt to tag the players on the opposing team. The chaser is allowed to run only in the direction that they are facing and in one direction through the center line where his eight teammates are positioned. They cannot stop and run in the opposite direction or cut across the line of teammates. The defenders send out three of their 12 players, or “dodgers,” out on the field at a time. The three dodgers try to avoid being tagged and are allowed to run around anywhere within the field’s limits. The dodgers will try to keep as many players alive throughout the seven minute innings. A dodger is dismissed if she is tagged by the chaser, if she steps out of the boundaries of the field or if she enters the field too late. Once the game has begun, the chaser is able to switch positions with seated teammates by touching them on the back and yelling "kho." The tagged teammate then becomes the chaser and can pursue the dodgers or switch positions with another teammate. Once the batch of three dodgers is tagged, the defenders send another batch of three out onto the field. They must do so before an active chaser provides a “kho,” or touches a teammate to become the new chaser. Remaining dodgers on the defending team at the end of the first inning are then able to be dodgers in the second inning. The game continues for two innings or until a team is able to tag all of their opponents.